The GOLDEN FLEECE AWARD is given by the Central Coast Taxpayers Association to the agency demonstrating the most arrogantly wasteful, and irresponsible actions and practices, often costing taxpayers millions of dollars and sowing distrust, disdain and downright outrage among the weary taxpayers of that agency. 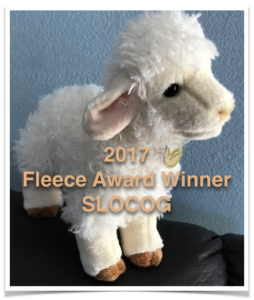 This first year’s Golden Fleece Award goes to the San Luis Obispo Council of Governments (SLOCOG) for using taxpayers dollars in support of Measure J. SLOCOG was formed in 1966 through a Joint Powers Agreement to promote transportation coordination in what was then a very rural county. It has grown to an agency with over 20 employees who are transportation planners, Rideshare coordinators, and assorted administrators and public relations flacks. In 2016 SLOCOG spent over $100,000 of taxpayer money on consultants to come up with a strategy to pass a 1/2% sales tax increase measure, allegedly for roads. SLOCOG also printed and mailed a 27-page booklet to “educate” locals about the bad conditions of their roads, in case they hadn’t noticed, again at taxpayer expense. The executive director, while collecting his government paycheck, coordinated a campaign effort that raised and spent over $500,000 to support this tax increase. But as we all know, Measure J failed in the November 2016 election. Even though the campaign was unsuccessful, Board members of SLOCOG were so pleased with the actions of their executive director that they awarded him a 5% raise for his valiant efforts to raise taxes. So much for the concept of merit pay! CCTA was instrumental in defeating Goliath with a mere $1200 and a grassroots campaign utilizing talk radio, letters to the papers, and word of mouth. Now the FPPC is investigating SLOCOG for the coordination and the expense of public funds used on the measure. Since some of the nominees are special districts, a bit of background is in order: special districts include water districts, sewer districts, school districts, cemetery districts and harbor districts. They serve a small geographic area for a specific, limited purpose. It is government at the most grassroot level. In theory, special districts are run by dedicated boards and staff in the most conscientious manner possible. In fact they rank among the worst offenders because they operate below the radar with little press coverage of their activities. The SLOCOG Board is made up of five County Supervisors and a mayor or city councilmember from each of the seven cities.